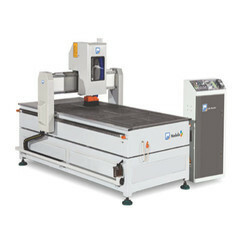 Offering you a complete choice of products which include cnc router j-1325 vt (a), cnc router j-1325 vt (l-atc), cnc router s2-1325ve, cnc router j-1325 and cnc router prince s2-1325 e.
Digital Signal Processor (DSP) for control system. Transmitting system parts with long years work, it can guarantee high precision and less machinery gap. Working table is vacuum table.7.5Kw vacuum pump is Air Type. Double linear bearing to drive the Y shaft, which improve speed and more stable, it can cut repeatedly. 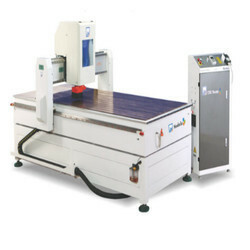 High speed and efficiency, empty speed is up to 50000/min, for engraving wave plank, the speed can reach 20000mm/min. Auto lubrication makes maintenance much easier. Compatible Software Compatible various CAD/CAM software like; Art Cam/ Type3. Self made mold, Heavy Duty and stable casted steel supporting bar. Whole structure processed with heat treatment for long run, error free accuracy. Linear type 6 auto tool changer with HSK tool holder, which reducing the unproductive time. Stronger and larger helical rack/ pinion and linear rail. The Railsare specially protected by hairbrush that installed in the blocks, When the machine in running, the clean rails working all the time. This will keep the rails with long time work without being abrasion and last the life of blocks and bearings in the blocks. A convenient, separate control panel box allows flexibility and efficiency in machine operating. High quality & accurate Syntec system from Taiwan. For vacuumed fixing and sure clamping of the workpiece, to ensure steadiness during the entire routing operations. Additional Vacuum pads 8 pcs for special through cutting work. 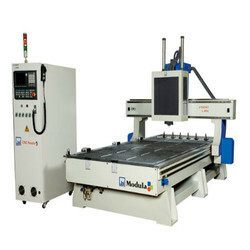 Technical quotations available on request CNC Routers with higher capacity Spindle J-1535 / J-2030 CNC Routers. Sh Hari Krishan Bimbraw started his business carrier in 1959 with Anant Group. Sh. Hari Krishan Bimbraw knew the technical developments in the industry of Wood Working Machinery, and so, he started his own firm by the name of Moonlit Industries. The contributions of Chander Kanta and Yogesh Bimbraw, mother and son of Sh. Hari Krishan Bimbraw, have supplemented the much needed support to take the company to its position today. The Company is having its business through out the world. It is also serving the reputed exporters and suppliers across the world. The company has its products in the local market as well as international markets. Because of their understanding and in depth experience in the technology of Woodworking Machinery and others, today Moonlit Industries stands for Quality, Perfection, Precision and durability. 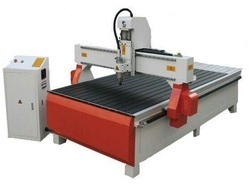 Technical quotations available on request : CNC Routers with higher capacity Spindle J-1535 / J-2030 CNC Routers. 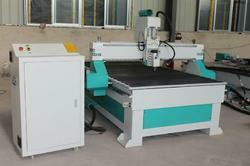 We provide CNC Router Prince S2-1325 E to our clients.